Texas Gov. Rick Perry will send a letter to U.S. Health and Human Services Secretary Kathleen Sebelius today informing her that Texas will not implement two portions of President Obama's health care plan despite the Supreme Court's upholding it last month. Perry specifically will express his opposition to establishing a state health insurance exchange and expanding Medicaid required by the plan. Ted Oberg of ABC News' KTRK-TV obtained a portion of the letter that will be sent to Sebelius this morning. "If anyone was in doubt, we in Texas have no intention to implement so-called state exchanges or to expand Medicaid under Obamacare. 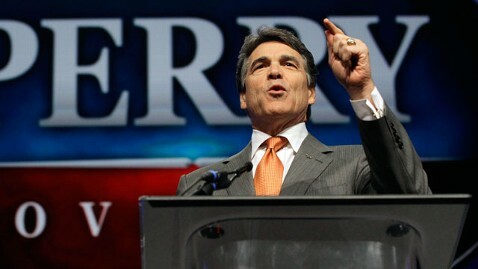 I will not be party to socializing health care and bankrupting my state in direct contradiction to our Constitution and our founding principles of limited government," Perry says in the letter. "I stand proudly with the growing chorus of governors who reject the Obamacare power grab. Neither a 'state' exchange nor the expansion of Medicaid under this program would result in better 'patient protection' or in more 'affordable care.' They would only make Texas a mere appendage of the federal government when it comes to health care."